On a picturesque 400-hectare portion of Tagaytay Ridge, just an hour and a half's drive from Metro Manila, an exclusive golf resort and residential development offers a temporary respite to the hustle and bustle of the city. Designed by renowned American golf architect Richard Bigler to follow the natural contours of the Tagaytay ridge, Tagaytay Highlands&#146; golf course features holes where the elevation difference between some tees and the green is simply breathtaking. The tee for the 513-yard 13th hole, for instance, is 84 meters above the green. In fact, the difference in elevation between the last and first holes of each nine is so dramatic that a cable car system, the only one in the Philippines, has been provided to ferry golfers from the ninth and 18th holes to the first and 10th tees. 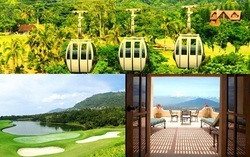 Another first is the Club&#146;s Funicular system, a 48-seater tram which takes Highlands members to the Midlands, another golf resort development overlooking Taal Lake and Volcano. Tagaytay Highlands was envisioned to be a self-contained leisure paradise for the entire family. Indeed, it has become a Shangri-la complete with world-class quality sports and recreation facilities and first-class vacation homes. Four residential projects, each with its distinct theme, have already been sold out, only to Tagaytay Highlands members: Pinecrest Village, a complex of condominium units much like the Swiss chalets; The Villas, a community of Spanish-Mediterranean style individually designed detached homes; The Belle View, a hillside condominium development built on a ridge overlooking Taal Lake, and the Woodlands, site of luxury loghomes made of solid western red cedar logs imported from the United States. To fully complement these residential projects, the Country Club at Tagaytay Highlands was born &#150; dedicated to provide a most interesting ambiance for recreation and leisure. The Country Clubhouse is home to a host of specialty restaurants such as Japanese, Thai, Italian, French, Mongolian and an Irish Pub. The most recent addition to the host of facilities is the Highlands China Palace, a two-level architectural masterpiece which can accommodate 400 diners. The restaurant boasts of authentic furnishings and service wares imported from China and a master chef from Hong Kong. Overlooking the scenic Taal Lake is the Highlander Steakhouse, a 130-seater log cabin known for its succulent and generous servings of steaks. Likewise, six specialty restaurants have taken shape on the second floor of the Golf Clubhouse, namely, Bali (Indo-Malay cuisine), Ginza (Japanese noodle house), Chosum (Korean cuisine), La Belle Brasserie (French cuisine), Marbella (Spanish) and Salzburg (Swiss-Austrian). The Sports Center houses all the indoor sports facilities like the indoor lap pool, the squash, basketball and volleyball/badminton courts, a fully equipped gym and a computerized bowling alley, to name a few. Just a stone&#146;s throw away from the Sports Center are outdoor facilities such as lawn tennis, skating rink, mini-golf links and the fishing pier. For those who enjoy communing with nature, The Gardens or the nearby Camp Highlands, a one-hectare camping ground, is a perfect hideaway. A special attraction of the Club, both for the young and the not so young, is the Animal Farm, home to a bevy of miniature animals imported from different parts of the world. All these and more follow a meticulously crafted master plan. All are designed to take optimum advantage of Tagaytay's natural attractions: its beautiful views, dramatic terrain and cool mountain climate. This, in a nutshell, is Tagaytay Highlands: a master-planned blending of natural and man-made wonders dedicated to leisure at its best.